Photos of Les Zaitz and the Malheur Enterprise courtesy of Les Zaitz; photo of Anthony Montwheeler courtesy of the Malheur Enterprise. THIS STORY HAS BEEN (JOYOUSLY) UPDATED. GO TO THE BOTTOM FOR THE EXCITING CONCLUSION. The First Amendment is on shaky ground, m’friends. 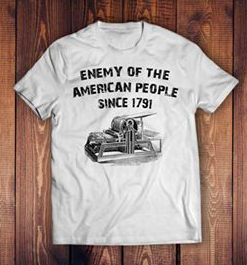 President Trump recently declared journalists the “enemy of the American people.” A Gallup poll last September found that only 32 percent of Americans trust mass media, an all-time low dating back to the Nixon era. Meanwhile, financially crippled news organizations are taking it in the pants. Now the government is getting in the act, suing reporters who file open-records requests for public documents. You know, doing their damn jobs. The thinning of newsrooms over the last decade has sent herds of veteran reporters, the brain trust of American democracy, moseying off into the sunset, or greener pastures, or wherever the hell people go to mosey. That’s precisely how it might have gone for my friend and former investigative partner Les Zaitz, who left The Oregonian (after twice being named a Pulitzer Prize finalist) to tend his horses out in the rangelands of eastern Oregon. Then last fall, Les took over the Malheur Enterprise newspaper (circulation 1,400), which covers a county eight times the size of Rhode Island. He doubled his staff from one reporter to two. It was there that Les, being the hardboiled, hardheaded, hardball investigative reporter he is, stumbled over a juicy little story practically spitting distance from the Snake River. The highlights: Oregon officials released a psychiatric patient named Anthony W. Montwheeler. He went home, allegedly killed his third ex-wife, then led police on a high-speed chase that ended when he drove head-on into a sport utility vehicle, killing one man and injuring his wife. It now appears Montwheeler was a terrific con man with a history of violence. He had successfully pretended, over two decades, to be batshit crazy, thus avoiding prison. When public officials figured out his fakery, the Oregon Psychiatric Security Review Board did something rather peculiar. The panel, aware that its bad boy posed a danger to his own family, simply cut him loose from all supervision. Oh, and they didn’t mention this to the public. The Enterprise sought records to understand the state’s actions and the Security Review Board denied access to 15 records used as evidence at its hearings. We appealed to Oregon Attorney General Ellen Rosenblum’s office, which agreed the documents should be released. The Security Review Board, rather than obey the order, sued the Enterprise in hopes of keeping the records secret. The lawsuit is extraordinary because it is only the third time in the past 30 years a state agency has defied an attorney general’s order to disclose records. The Security Review Board has hired private attorneys for the case. The lead lawyer on the case will bill the state agency $400 an hour. As a tiny newspaper and a small business, the Enterprise can’t match that kind of legal firepower from its own pockets. The East Oregonian newspaper, in an editorial today, came out in support of Les and Enterprise co-owner Scotta Callister, Les's long-suffering wife. So here’s where it stands: The Malheur Enterprise is raising an Enterprise Defense Fund. I’m going to donate a little money. So should you. Meanwhile, there are two T shirts being circulated for journalists and supporters of the First Amendment to show their colors. One is from a group of University of Texas journalism students, which you can learn about and buy here. The other is one of my own design, which you can find here. "Under pressure from Gov. Kate Brown, a state agency (the board of psychiatrist examiners) Tuesday dropped its lawsuit against the Malheur Enterprise and will turn over public records concerning accused murderer Anthony W. Montwheeler," the newspaper reported. The contested records were to be released late Tuesday." This is a victory for every news organization in America, not just the tiny weekly. Let us end with a quote from the First Book of Samuel: "And David put his hand in his bag and took out a stone and slung it and struck the Philistine on his forehead. The stone sank into his forehead, and he fell on his face to the ground."